My business card reads Vice President of Sales and Marketing. In my heart, though, I am still the territory sales representative I was at the beginning of my career. Sitting in front of a customer and making my pitch is what has driven me for 29 years at Dixon. For that reason, you might think that US Manufacturing Day, which we celebrate on October 5th this year, would have less meaning to me than others at Dixon. Plant managers, machine operators, and maintenance supervisors spend their days “manufacturing” – turning castings into finished parts, repairing and maintaining machines, and producing Dixon products. I just sell what they make. Above: A snapshot of our timeline as a US Manufacturer. To see timeline click here. But working for a U.S. manufacturing company means a lot to me. 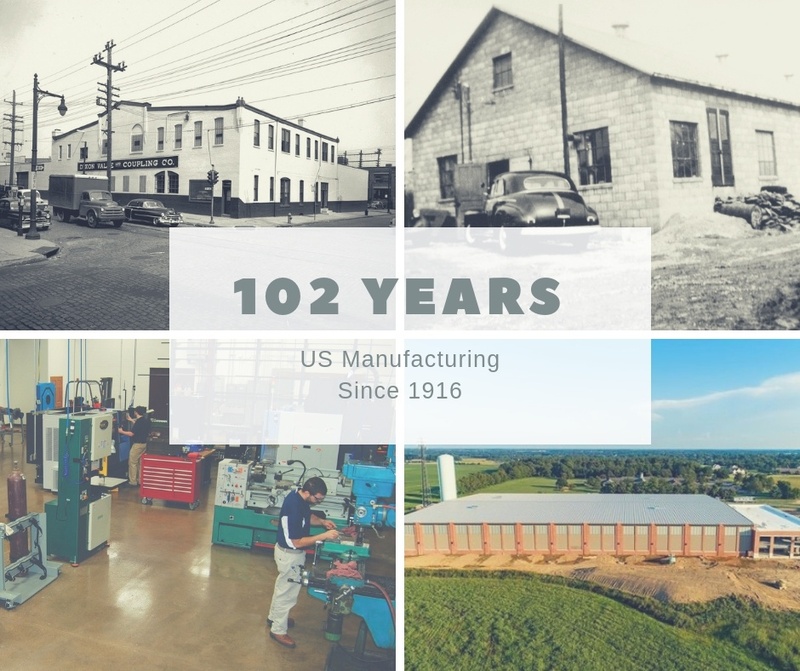 Dixon has been manufacturing hose fittings, valves, and fluid transfer related products for 102 years. When I come into work in the morning, I pass through the shop lobby, smell the distinct aroma of machined metal and cutting tool oil, and look out to the shop and see familiar faces, doing their jobs. It makes me proud. I am watching my teammates doing their jobs, in pursuit of victory. It makes me feel accountable to them, too. If I do my job, they keep their jobs. Sometimes, it even makes me feel nostalgic. It makes me think of the beginnings of Dixon, when the products we made were used to help build highways, bridges, dams, and tunnels across the United States, and when coal mines and steel and paper mills were thriving. It was a time in our country’s history when national endeavors like the construction of our highway system helped grow our nation, and when mills fueled the engine that drove our economy. Above: Our original location in Philadelphia, PA.
Today, Dixon works with its distributors to provide products and solutions to U.S. manufacturing companies like Boeing, U.S. Steel, Halliburton, and Kraft Foods. Instead of helping to build the United States transportation highways like we did one hundred years ago, we are providing safe connections and solutions to oil companies, chemical and petroleum tank trucks and terminals, food and beverage plants, and many more of America’s key industries. The industries have changed in some cases, but the chance to play a role in something with a national impact remains constant. And the products we manufacture are evolving. Dixon’s core offering of industrial hose connections remains the preferred brand, but we now offer higher engineered products that are providing solutions to some real challenges our end user customers face in the field. In Dixon’s strategic planning document, it specifically states that Dixon is committed to remaining and thriving as a North American manufacturing company. While many people would want us to believe that manufacturing is dying in the United States, we continue to grow. Dixon and its foundry currently employ more than 500 people that work directly in manufacturing jobs in the U.S., which is up more than 15% from just two years ago. We are investing in automation, which allows us to compete more effectively in a competitive global market. And we are investing in innovation, by setting ambitious goals for new product development that will increase our U.S. manufacturing footprint. Dixon currently manufactures in eight different states in the U.S. (Maryland, Pennsylvania, Virginia, North Carolina, Texas, Ohio, Illinois, and Wisconsin). And maybe the clearest sign that U.S. manufacturing is thriving at Dixon? 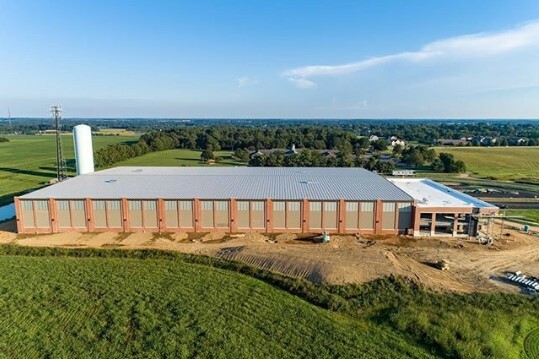 The construction of a new company headquarters, distribution center, and manufacturing building across town from our current location in Chestertown, Maryland – scheduled to be completed in early 2020! Above: Our new distribution center being built in Chestertown, MD. As we celebrate U.S. manufacturing day, I would like to take the opportunity to thank our customers for supporting Dixon and other United States manufacturing companies. I would like to thank our sales team, customer service team, and distribution team, for fulfilling Dixon’s value proposition of being the easiest company our customers do business with every day. But most of all, on behalf of Dixon’s sales and marketing team, I would like to thank everyone at Dixon who works in manufacturing. Thank you for doing your job so well, so that it makes it easier for us to do ours. To see a detailed timeline of our company click here.